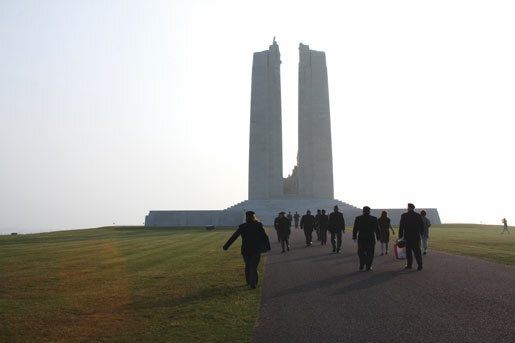 Members of the Legion pilgrimage approach the Canadian National Vimy Memorial. A century ago, Alex Wilson of Killam, Alta., won a watch at a carnival. It was in his pocket when he enlisted and during the Battle of Passchendaele when he was wounded. The young stretcher-bearer returned to Canada with two things he loved—his bride, Leah Beatrice Jones who had nursed him, and the prized Elgin watch. 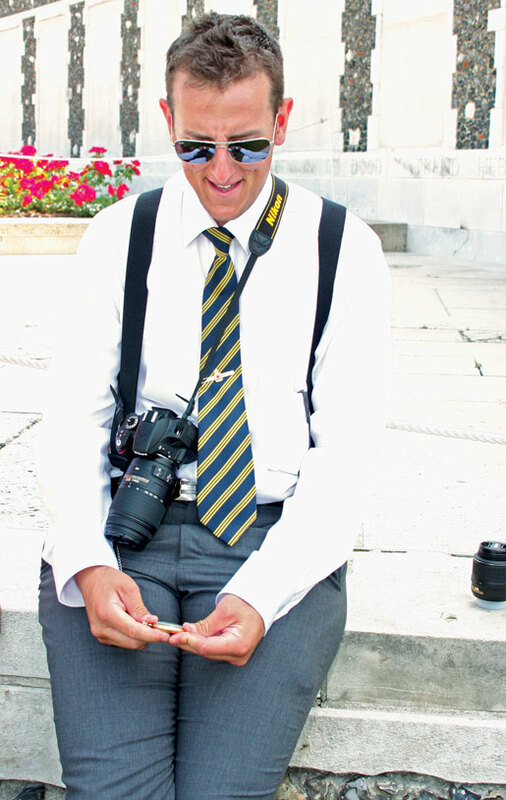 “When I inherited the watch in 1969, it was broken,” explains Alex’s son Dave who did not participate in the pilgrimage. “We wound it up but it never worked again.” With the finish worn away and hands fixed between 11:04 and 11:05, the watch was a family heirloom telling not the time, but of a different time. Then he heard the ticking. Alec Dreichel admires his great-grandfather’s pocket watch. “The rational explanation is that it got jostled around during the trip,” offers Dreichel. “But in my heart, I know there is no rational explanation.” It felt as though his great-grandfather had tapped him on the shoulder. Pilgrims often feel touched by the spirits of those they honour. They find it possible to mourn afresh strangers killed long ago or to feel close to an ancestor who died in the war. “There is a difference between a battlefield tour and a pilgrimage,” explains John Goheen, guide of nine Legion pilgrimages. Part of that difference is something he calls “informed memory,” a process of studying the history, visiting sites where it happened, learning fates of those who lived it, and commemorating those who died. A big part of it has to do with the emotions pilgrims feel. “Standing in the water, you swear you can feel the anguish,” adds Ontario Command pilgrim Belinda Wilson. Charles Leguerrier wipes away tears after he and Sam Newman place a wreath on the roadside memorial to Andrew Mynarski, VC. These are the first tears shed in the two-week pilgrimage to battlefields, monuments, museums and graveyards in France, Belgium and Holland that mark Canadian courage and sacrifice in the two world wars. Joining Dominion Vice-President Dave Flannigan, head of the delegation, and his wife Vera were Goheen, a school principal from Port Coquitlam, B.C., and provincial command pilgrims Dreichel; Shaun Francis of Aldergrove, B.C. ; Wilson of Fenelon Falls, Ont. ; MacDonald of Souris; Lane Gray of Quill Lake, Sask. ; Tom Irvine of Montreal; Kathleen Kennedy of Stellarton, N.S., and her husband Don; Linda Kohut of Winnipeg; Selby Luffman of Mount Pearl, Nfld., and his wife Helen; and John Ladouceur of Haneytown, N.B., and his wife Helen. Paying pilgrims included Allan Hodgson of Nipawin, Sask. ; from Alberta, Calgarian James Baldwin and Rita Hill of Vulcan; Ontarians Charles Leguerrier of Fonthill, Sam Newman from London, and Betty and Percy Price of Ottawa; and Ed Fewer of Grand Falls-Windsor, Nfld. The last part of the July 6-20 pilgrimage concentrated on First World War sites—Passchendaele, Beaumont Hamel and the Battle of the Somme. Essex Farm, where Lieutenant-Colonel John McCrae wrote In Flanders Fields and Wimereux Communal Cemetery, where the soldier-poet is buried and Vimy Ridge. There all four Canadian divisions fought together cohesively for the first time. It was a crucial step towards a national identity, says Goheen; many had signed up as British, but ended the war feeling Canadian. Sam Newman and Legion Dominion Vice-President Dave Flannigan salute at Tyne Cot Cemetery. 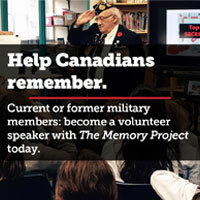 The journey began with Second World War sites—Juno Beach and the towns and fields where Canadians battled their way inland in 1944; Dieppe where a disastrous raid in 1942 claimed the lives of 907 of roughly 5,000 participating Canadians; the Leopold Canal, site of frenzied fighting during the Battle of the Scheldt. Today it is a half-hour drive, but in 1944 it took the Allies more than a month to fight their way from Juno Beach to Caen. The monument to the 9th Canadian Brigade at Hell’s Corner is named for the vicious fight near Villons-les-Buissons, France, with the fanatical 12th SS Hitler Youth Panzer Division. 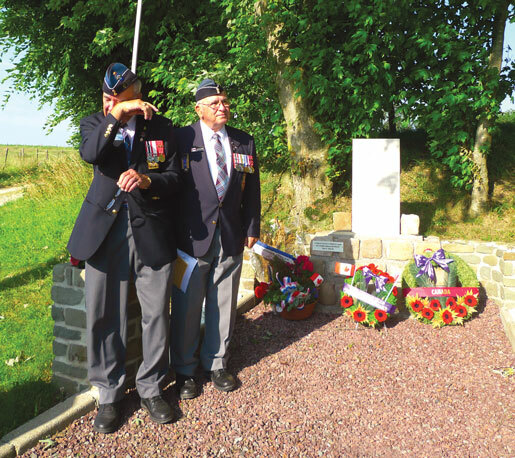 Goheen tells of Private Lorne Brown of the North Nova Scotia Highlanders, a wounded soldier bayoneted eight times, the first of more than 150 Canadians murdered in the first weeks of the battle for Normandy. Pilgrims carry their sombre mood to a ceremony at Abbaye d’Ardenne where 20 Canadian prisoners were interrogated and beaten, then led into the garden and murdered by blows or shots to the head on June 7, 8 and 17. “I felt so much sadness there, so much evil, so much pain,” says Wilson. No pilgrim is unaffected by the garden, dank and dark, lacking even birdsong during the two-minute silence. The grim mood persists at Château d’Audrieu where pilgrims place a wreath in the woods to remember 26 Canadians who were executed. Teacher James Baldwin adds a message from a Grade 4 student, part of a school remembrance project. “It’s a three-pronged thing; they write a message, it’s placed in remembrance and someone else coming along reads it.” It’s particularly satisfying to place it in this out-of-the-way place, he says, which can easily be missed as a site of remembrance. 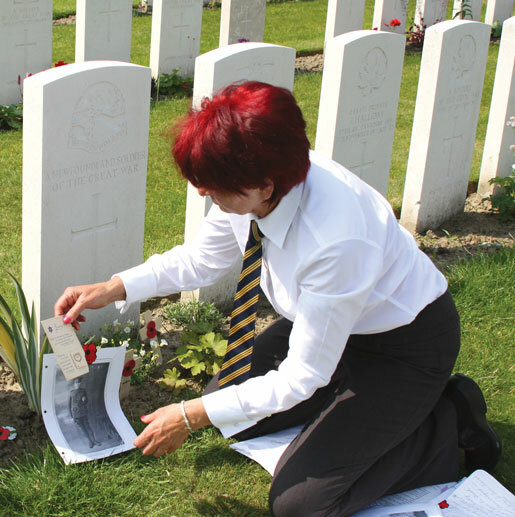 Linda Kohut at the grave of Private William Dodds, Tyne Cot Cemetery. Evidence of the wars can be found on old buildings where bricks are pocked by bullet holes or have a patched-quilt appearance where shell holes were repaired. It is not uncommon to find unexploded ordnance—even from the First World War—left by a farmer near a memorial for collection. A few minutes’ search around any battlefield cemetery turns up wartime detritus. The Legion pilgrims avidly collect such mementos for presentations they’ve pledged to do upon return. Gray proves to be a champion collector, finding tiny shrapnel balls and the head of a shell; Irvine finds an entire bullet. Throughout the tour, each pilgrim presents a graveside presentation about a First World War soldier. Gray introduced Alex Decoteau who set a Dominion record for the five-kilometre race at the 1912 Olympics and became Edmonton’s first aboriginal police officer. He was killed at Passchendaele in 1917, but his name lives on in sports halls of fame and a five-kilometre road race. But most presentations are about soldiers whose major claim to fame was that they simply did their duty. Such was Private William Dodds whose name is kept alive on his gravestone at Tyne Cot Cemetery; on cenotaphs in Glenboro, Man., where he farmed, and Wroxeter, Ont., his hometown; and “a place he could never have imagined—online,” on such sites as that of Canadian Great War Project, notes Manitoba pilgrim Linda Kohut. Pilgrims also look up names of soldiers on gravestones or memorials and visit battle sites for family and friends. At Beny-sur-Mer Canadian War Cemetery in Normandy, Gray finds the grave of Lance Corporal Alvin Milton Rustad of Rose Valley, Sask., on behalf of Rustad’s nephew. Rustad died on D-Day, his amphibious tank going down before reaching shore. Gray places a cross made by his students on the grave. Here too, Hodgson finds the headstone of his uncle Harry Anderson who, like Brown, was killed instead of taken prisoner on June 9, 1944. “He’s probably got the biggest family of anyone here—but nobody’s visited his grave.” Later at the Canadian National Vimy Memorial, Hodgson finds the name of his great-uncle Arthur Hodgson who went to war alongside three brothers who all returned home. Victor and Jack lived to “ripe old ages,” but Billy died from the effects of poison gas. Closure was found for Flannigan’s family in visits to the grave of his namesake and great-uncle, a member of the Newfoundland Regiment’s First 500. Captured in 1916, Flannigan’s great-uncle died a prisoner of war at 20 and is buried in Tournai Communal Cemetery, Belgium. “I looked through the book and the only soldier whose grave was never visited was his, and it really tore me apart,” explains Flannigan. “He has been visited now, twice.” It’s speculated he and two dozen other prisoners who died on May 4, 1918 “of injuries from a single bullet wound” were murdered, likely to cover up brutal treatment. 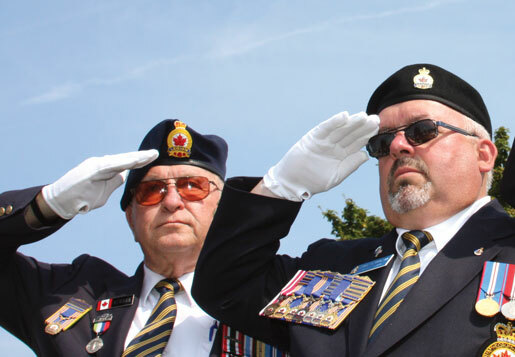 The 2013 pilgrims take part in 11 formal commemorative services, including one at the Menin Gate in Ypres where traffic stops at 8 p.m. for a nightly Last Post ceremony, and at the Vimy memorial where they are given the Vimy Pilgrimage Medal. 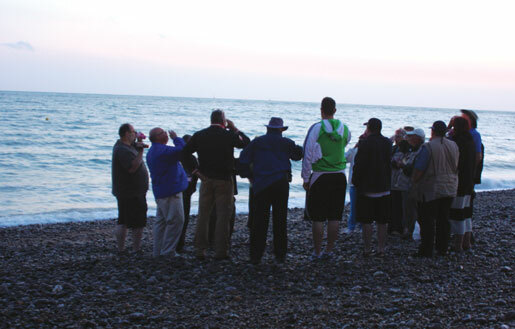 Pilgrims toast the fallen and the wounded at Dieppe. On Juno Beach, Hervé Hoffer, owner of Canada House, shows pilgrims his memorial to the Queen’s Own Rifles, who lost more than 100 killed and wounded on D-Day; near Authie, Daniel and Denise Collet of Amis du Canada host a garden party and tell war stories; during a brief stop in Tailleville, the mayor and his wife arrive unexpectedly with a photo album to enrich the discussion; a man walking his dog at Pourville near Dieppe tells MacDonald how the tide was red the day of the raid, and is outraged there is no flag on display to honour the pilgrims. “This is your beach,” he says. In Adegem, Gilbert Van Landschoot says he built the Canada-Poland War Museum to thank the liberators who likely saved his father from the Gestapo. At the Mont Ormel Museum, a local man chokes up describing the battle around Falaise Gap, where trapped Germans were desperate to escape, and the Canadians and Poles were determined they should not. The stench in the August heat of 1944 could be detected by planes overhead and it took 20 years—his entire childhood and youth—to clear the battlefield. 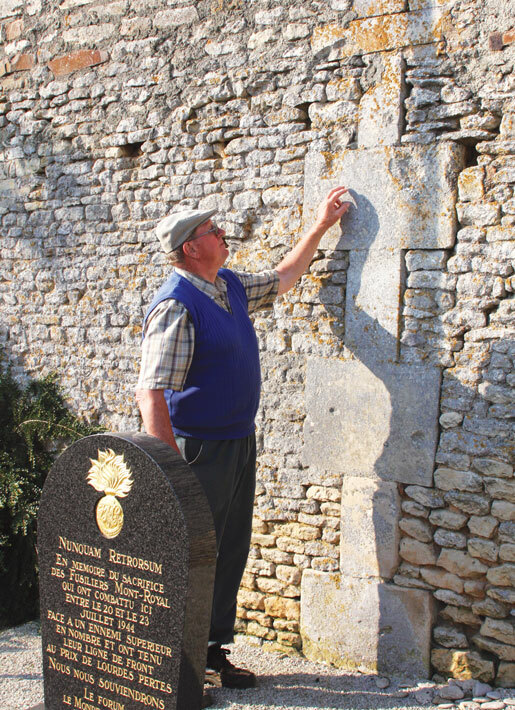 French farmer Guy Frimout points to bullet holes. Irvine served 23 years with the Black Watch, including a United Nations Emergency Force tour to Egypt. He was also ambushed by emotion, particularly at Verrières Ridge where most of the Black Watch regiment was wiped out in 1944. “Here I am actually setting foot where they marched.” He does a rubbing of the gravestone of Major Frederick Philip Griffin. Thrust into command at age 26 after his commanding officers were killed and wounded, Griffin had orders to advance over the ridge. Lacking tank support, he led 300 men stoically over open ground under enemy fire; 60 reached the top, but only 15 survived; Griffin’s body was found at the hillcrest.